Those out there that choose, against their better judgment, to read these regular posts know that we enjoy taking off-the-beaten-path pieces of data and relative strength charts to show how different markets are evolving and reacting over time. In this installment we want to revisit some charts across the market spectrum we haven’t looked at in a year or more to see if they tell us anything about future market direction. We’ll try not to bore you with lots of words…so let’s begin with three relative strength charts that use gold price as part of the ratio: S&P 500 price to gold price; dollar index to gold price; and oil price relative to gold. 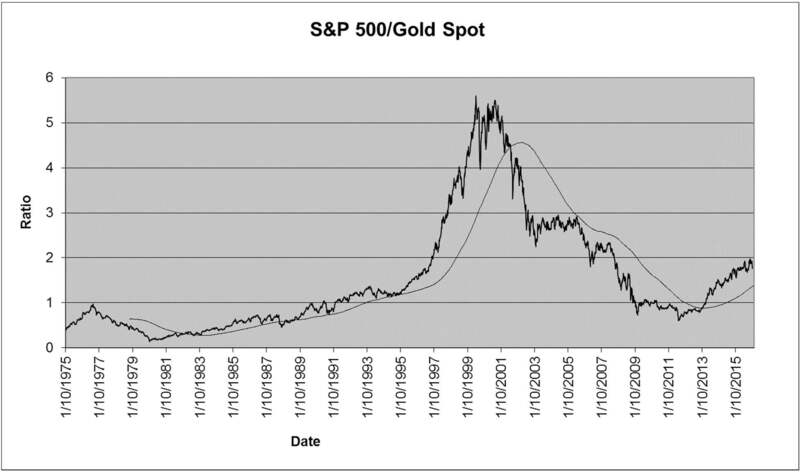 After a long downward trend in this ratio, reflecting the struggles of the S&P 500 from the early 2000s through the financial crisis, and the concurrent massive upward spike in gold prices over the same period, the ratio has resumed an upward trajectory somewhat reminiscent of the path observed during the 1980s and 1990s. Significant crosses of the 200-week moving average for the ratio (1982, 2001, for instance), represented on the chart, have generally coincided with major secular bull/bear turning points for equity markets over the past 40 years. 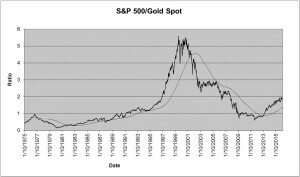 Historically, many people think of gold holdings as protection against the “debasement” of the US dollar. Last decade this relationship held up as significant weakness in the dollar index was accompanied by the sharp increase in gold price that drew so many to metal, not to mention other commodities. Until the sharp upward trend in this ratio in the early 2000s, this ratio had exhibited a statistically significant “stationary” statistical trend over the prior 30-year period, as one might hypothesize. This went completely out of whack between the early 2000s and gold’s peak (and the dollar’s stabilization) in the 2011/2012 timeframe. Since 2011, the ratio has been cut in half. Nonetheless, the ratio remains far above levels observed during the “stationary” period. 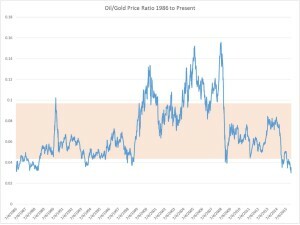 Using standard deviation as a guide, this ratio is in a similar statistical position relative to historical mean as the real/inflation-adjusted price of gold over time. 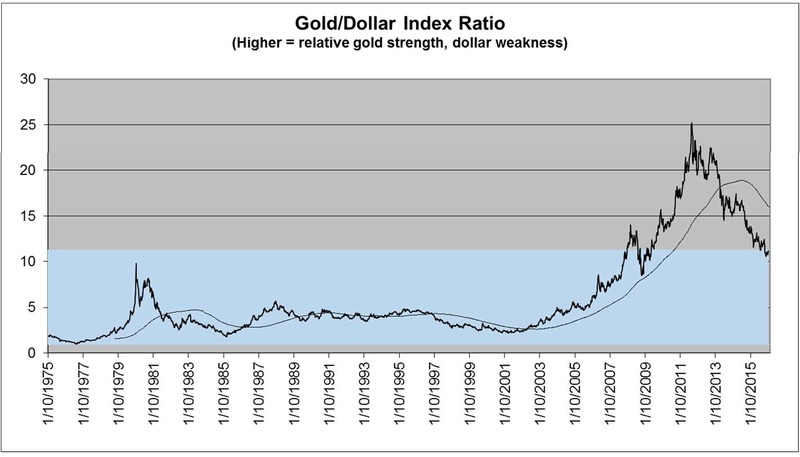 Combining this chart with the SPX/gold relative strength chart above and other charts, such as historic real gold price, convinces us that gold has plenty more downside before finding a stabilization. 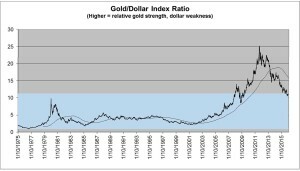 Likewise, this chart seems to tell us that the dollar might have more upside potential over time than many believe. In both cases, oil price represents the numerator. With the shockingly sharp move downward in oil, we’re more interested in what this may say about the oil price collapse than the move in gold price or equity prices. 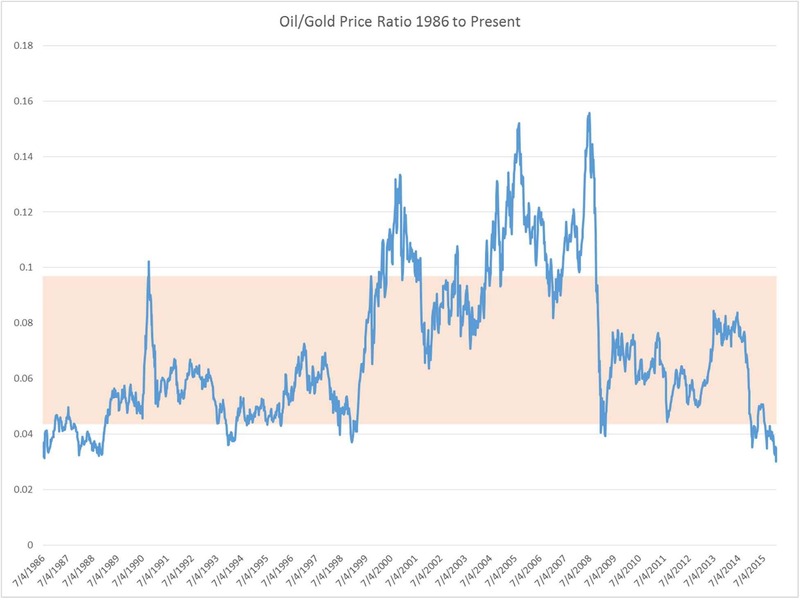 As you can see, the oil to gold price ratio has reached the lowest level observed over the past 30 years. 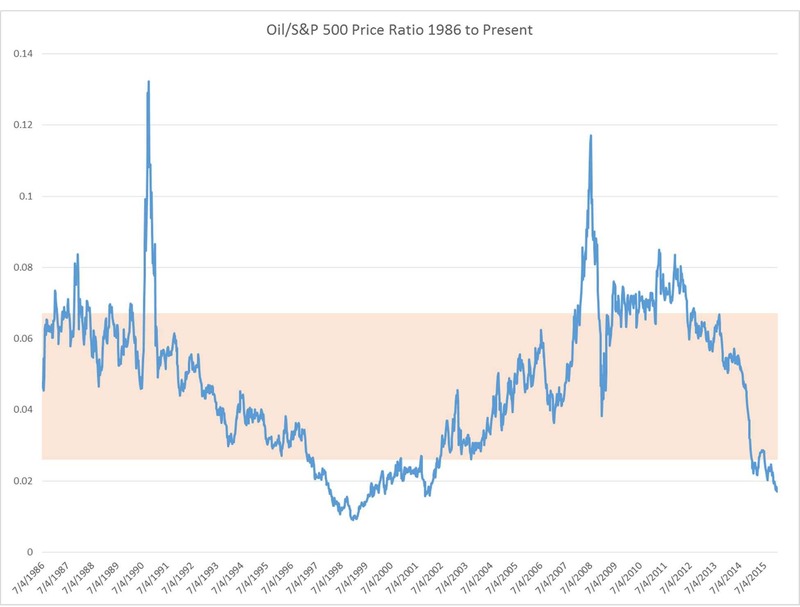 The oil/S&P 500 ratio isn’t quite as dramatic, but a similar picture emerges. 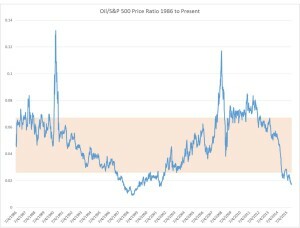 In the past, ratio moves below the -1 standard deviation band have represented intermediate to long-term stabilization points for oil price. Is oil ready to go back to $100 per barrel? Not exactly, but we do believe WTI crude is close to stabilizing based on these charts and other data. If nothing else, these charts provide another stark visual as to how painful the oil price decline has been relative to the movement in other asset prices. This chart takes us back in the direction of evaluating the future path of equity markets. 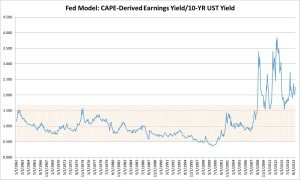 The so-called tradition “Fed Model” is derived by taking the trailing 12-month P/E ratio for the S&P 500, inverting it to create the “earnings yield,” then taking the ratio of the “earnings yield” to the 10-year Treasury yield. In theory, when the higher the “earnings yield” relative to the 10-year Treasury, the better the prospects for equity markets, and vice versa. Historically, the trailing 12-month P/E ratio has proved quite volatile, especially during major economic and market upheavals such as 2008, owing to earnings volatility during those eras. As you can see above, loosely, higher spikes in the Fed Model ratio have coincided with the beginning of equity market cyclical or secular bull runs. The absolute bottom in the ratio during the 1999/2000 timeframe of course coincided with the highest market valuations recorded in the modern era. 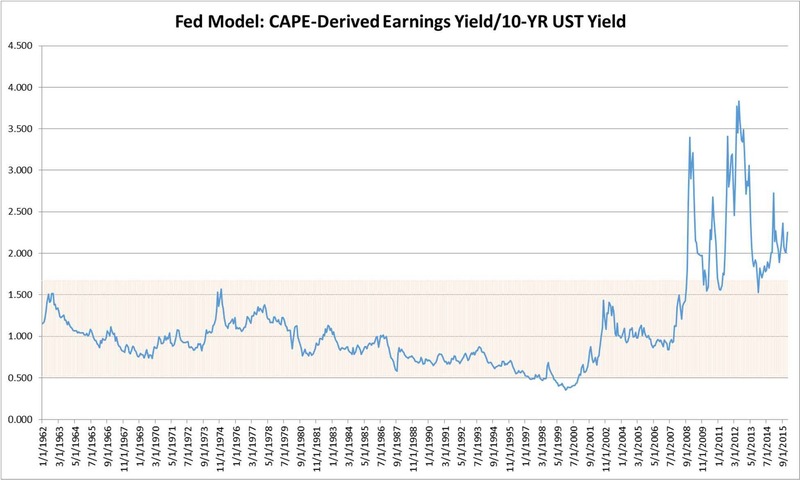 Since the market collapse in 2008, this version of the Fed Model shows that the S&P 500 has been dramatically undervalued when viewed against 10-year Treasury yield levels. Isn’t this ratio distorted now by historically low Treasury yields? That’s a fair question. We can’t dispute, though, that equity markets have remained on an upward tear since this ratio exploded to the upside. With this week’s correction, the pro-forma CAPE we prefer stands at approximately 20.5x, above the historical median of 17x for sure, but not outlandishly high (about ½ a standard deviation above normal). If 10-year Treasury yields double from here and the CAPE goes from its current level to 25x, the CAPE-based Fed Ratio basically would fall back to the middle of the long term range. Thus, as we discussed with the S&P 500/Gold ratio above, we don’t believe it’s terribly outlandish to combine this indicator with other evidence out there showing that equity markets can continue to surprise to the upside over the intermediate-term.